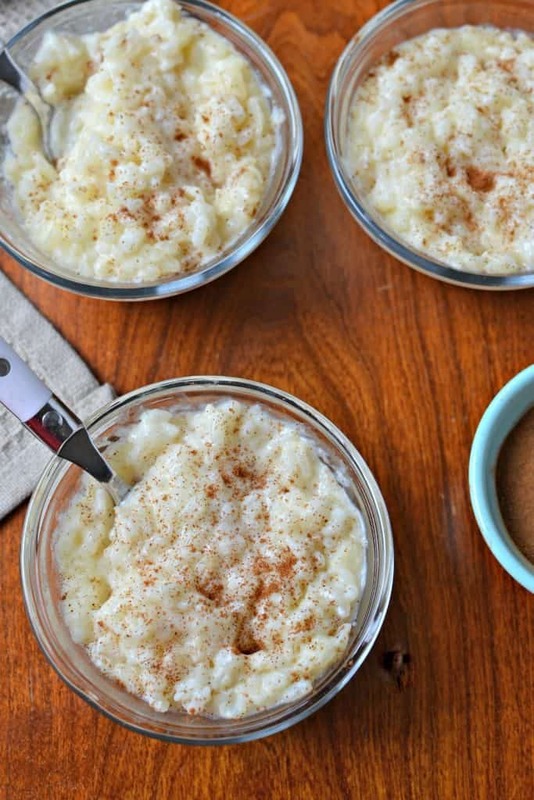 This Rice Pudding Recipe is one of our family favorites. It is rich, lusciously creamy and is so darn easy to prepare. Whether you enjoy it warm with butter, milk and brown sugar or cold with cinnamon and nutmeg this recipe will quickly become one of your favorites. Rice Pudding is one of those dishes that either you love or you hate. I personally am a huge rice pudding lover. I would much rather have a big bowl of it than a piece of cake or bowl of ice cream. If you are in same boat as me then you really must make this recipe. You will be absolutely thrilled with the results from this easy recipe. Preparing it right in your own kitchen gives you peace of mind over the ingredients and a chance to enjoy it both warm and cold. How to make Rice Pudding Recipe. This easy yet amazingly delicious recipe starts with cooked rice. The rice is then combined with milk and cooked until thick and creamy. In the final steps a tempered egg, sugar, butter and vanilla extract are added. The mixture is cooked just a couple more minutes and then you can add whatever you like or spoon into individual dishes so everyone can adjust their add ins to their liking. Please be sure to read the helpful hints on tempering eggs. Delicious add ins for Rice Pudding Recipe! How to temper an egg! You really don’t want to add an egg to a hot mixture without tempering it unless of course you are after that kind of effect like in egg drop soup. But in this case we want the egg to fully incorporate into the mixture like in a pudding or custard. In a separate bowl beat your egg. Now simply add 1-2 tablespoons of the hot liquid whisking constantly. Once whisked in, repeat again thoroughly whisking after each addition. If the bowl is small enough to fit in the palm of your hand you will probably begin to feel it warm. Once the egg mixture has begun to warm you can slowly whisk it into the warm pot without worrying that you will end up with a scrambled mess. Helpful hints on making this Rice Pudding epic! Use medium or short grain white rice. Do not use long grain rice. Use 2% or whole milk. Skim does not have enough fat. Cook over medium low heat stirring almost constantly. You don’t want this to burn on the bottom of the pan. Make sure you temper the egg so that you do not end up with curdled or scrambled eggs. Add the ingredients in the order they are written in the final steps. Store leftovers in the fridge. The Rice Pudding will stay good for several days. If the Rice Pudding becomes too thick for your liking add a couple of tablespoons of milk at a time until desired thickness. 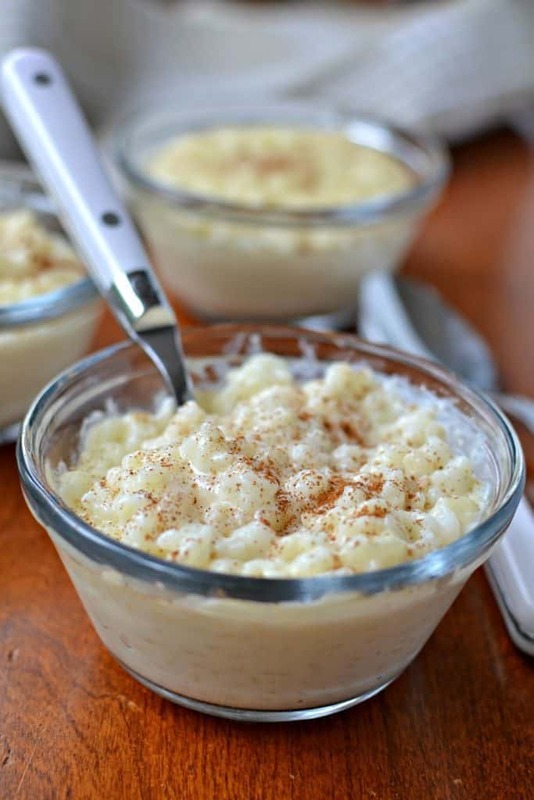 This amazing Rice Pudding Recipe is so delectable, easy and dependable. What are you waiting for? Put the ingredients for this treat on your shopping list today. Your loved ones will be singing your praises. Other light dessert recipes you will love! 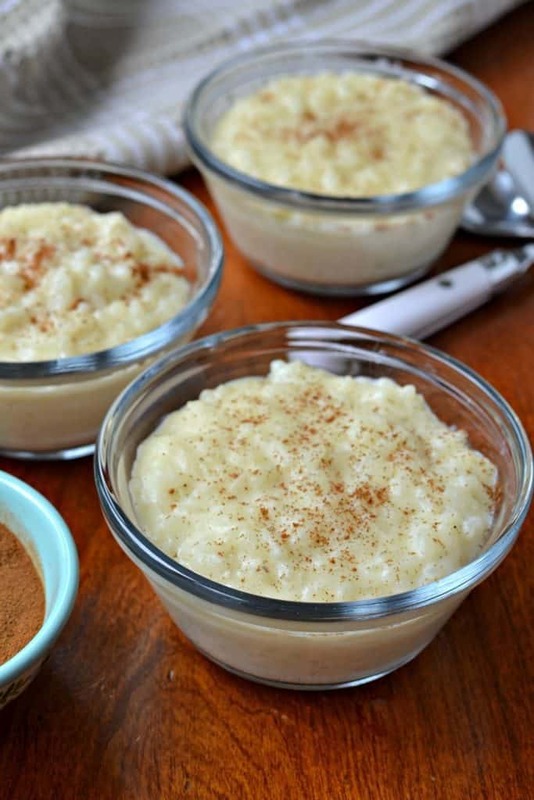 This old fashioned Rice Pudding Recipe is one of our family favorites. It is rich, lusciously creamy and is so darn easy to prepare. In large saucepan bring water to a boil. Add rice and salt; bring back to a boil. Turn to simmer, cover with tight fitting lid, and cook 15-20 minutes or until water is absorbed. Increase heat to medium low, add milk and cook until thick and creamy stirring constantly; approximately 15-20 minutes. In small bowl whisk egg. Add 1-2 tablespoons of the hot liquid to the egg; whisking constantly. Once whisked in, repeat again adding 1-2 tablespoons of the hot liquid to the egg; whisking constantly. Repeat if necessary thoroughly whisking after each addition until the egg mixture has warmed. Slowly whisk the egg mixture and sugar into the rice/milk mixture. Cook for an additional 2-3 minutes. Turn off the heat and stir in butter and vanilla extract. Happened to try this recipe out last week, and, THANK YOU!! I’ve tried a lot of rice pudding recipes and this is the only one I’ve ever been happy with. And not just happy, but in heaven. It’s perfect (and so simple)! Added a little cinnamon/nutmeg to mine, and plan to try it with cardamom next. Cheers! I love your sweet comment. I am so glad that you like it. I try my best. I love cinnamon and nutmeg in mine too! Delicious!!! I could eat the whole pan! Have you ever baked it in the oven ? I made and loved it. I am so glad that you loved it! Could you put all ingredients in a crockpot , would this work? I have never tried but I do not think it would work. It needs to be stirred quite a bit to make it creamy! I am not sure that a crock pot could maintain temperature with the lid off. It will not turn out as creamy. You should be able to print every recipe unless your system is blocking it because of advertising. I sent the recipe to your email. I hope that works for you. I don’t have a printer ,so may I please request you send it to my e-mail ? I would love to make the rice pudding for my great-grands for Christmas. You wouldn’t happen to have the recipe for bread pudding too ? If so please include that also. I just sent it via email. I hope you enjoy! I also do not have a printer. Could you also email this recipe to me via email and also a bread pudding recipe. I have tried so many recipes for bread pudding and I can not seem to make it turn out like my Mom’s. No problem. I sent it off a little bit ago! Enjoy! Thanks for the heads up! I sure do love rice pudding. I have never needed cornstarch to thicken this. It always thickens nicely. I will have to look for that Señor Rico! Can you please email me your Rice Pudding Recipe . I don’t have a printer. Thank you very much . I greatly appreciate it. Could u send this to my email also. Can I use instant rice? Why can’t we use minute rice? I have never tried. I just saw a recipe for minute rice pudding on All Recipes. I mean you are stuck in the house. Why not try. I don’t think you are going to get the same creamy result but who knows unless you try. I just made it. Will it thicken up as it cools? Mind seemed a bit runny. Great taste though! Hey Raymond it will thicken a little as it cools. Did you use medium or short grain rice? Did you use 2% or whole milk? Best question yet did it thicken as it set? Hello Beth. I used short grain rice, and whole milk. It did thicken a bit in the fridge, but still very runny. I love the taste. I will definitely try again. Maybe I need to let it thicken more once I add the milk? Hey Raymond! Yes cook it until it is thick and creamy. It may take a couple of minutes longer depending on how high your heat is. Don’t want it too high or it might burn. Make sure you are stirring a lot. Oh one more thing don’t rinse your rice. I know some people do before making rice for stir fry but you want the starch there so don’t rinse it. Thanks so much Beth for the tips! I will try again. Do not use long grain. It will not work near as well. Please helpful hints on making rice pudding. nutmeg. We always used to fight over it. Do not like the baked one. Thanks so much for posting. Oh yummy, this reminds me of growing up with my Grandparents. I just used cinnamon this time, but I’ve gotta try chocolate chips too! Cool beans! Always nice to make a recipe that shares a great memory! Chocolate chips sound great! 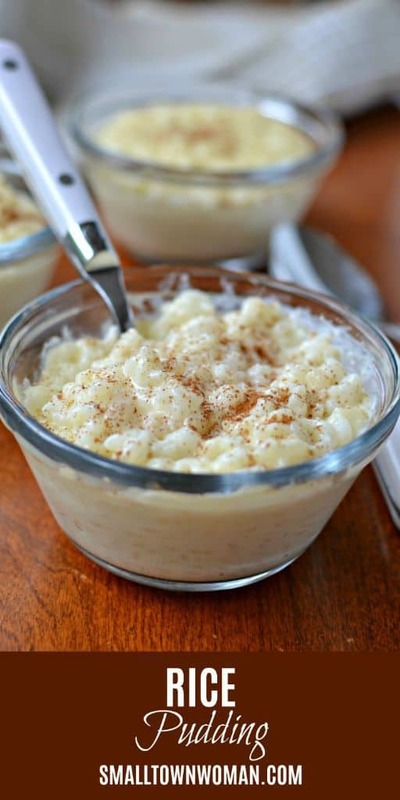 This is a great recipe & it’s exactly like one of my go to rice pudding recipes! I either make it like this, or I have another recipe where I cook the rice in the milk and add heavy cream. Both versions are great. And you’re absolutely right about using short or medium grained rice-it makes it so creamy! I actually like to use a combination of Arborio (short grained risotto rice) and medium grained rice. Sometimes I use some evaporated milk too, which is delish. I loveeee rice pudding lol & I make it a lot, so I have a few different variations on it. Thanks Kris! I love rice pudding too! So delicious! Thanks for all the heads up on ingredients. I wish I had some rice pudding right now for my breakfast! I just made this rice pudding, OMG it is delish. Thank you. I’m glad i went out and bought Goya Medium Grain Rice. Awesome! I am so glad that you liked it! I love rice pudding! Nothing beats the flavor of real rice pudding. You cannot duplicate that creamy, sweet goodness with the stuff from the store. I can’t wait to give this recipe a try. Thanks so much for all the tips! Mine turned out perfectly and my husband wants me to make it again next week! Love me some rice pudding! I’ve never made it, but this changes everything! Can’t wait to make it. Thanks so much for the tempering tip! You are most welcome! You should make it! So easy and scrumptious!! ive never made rice pudding before. It looks so lovely, i need to try it before the weather starts getting warmer, looks like a perfect winter warmer. Thanks so much! It is so delicious! You should give it try. Everything is a better with a little bourbon! This is so creamy and perfect! 5 stars!!!! I love rice puddings, this one is very easy to prepare. Thanks a lot. Thanks so much Chad! I love rice pudding too! I haven’t had rice pudding in so many years. I have to make some for the family soon. Wow, this rice pudding looks so creamy, i will surely try this rice pudding recipe, i am pretty sure it is perfect and delicious. Thanks so much Surekha! I hope you love it as much as we do! I don’t think that I have ever tried rice pudding before but it actually sounds really good. It also looks easy to make! It is delicious and easy. I hope you try it! I just learned rice pudding from this article, it looks interesting recipe to try out. Thanks for sharing. 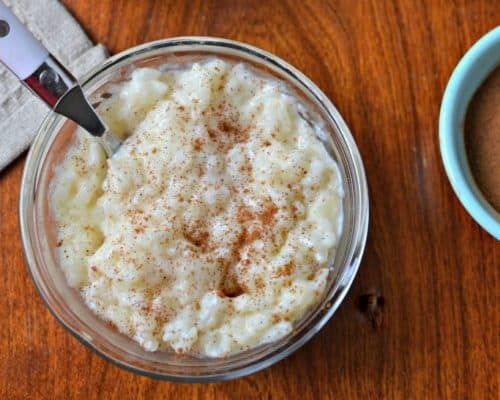 We love rice pudding in our house but I have never tried making it myself. Might have to give this recipe a try. This dish looks delicious! Great tips on how to temper an egg; that can be tricky! The ingredient is easy for us as we have rice everyday but I have not tried rice pudding before. Look super delicious and will try it out one day. The best rice pudding I’ve ever had! This looks so delughtful and tasty. My kids would absolutely this. I have to try making this. This looks so easy to prepare for my kids. They will love this for sure. Omg can we say yum!!?! I’ve never made rice pudding, but it doesn’t look too difficult. Might have to give this a try! It is very easy, creamy and delicious!! Yum, I love rice pudding. It’s the best winter dessert. You inspired me to make some this weekend! You are going to love it. It is delicious! It is delicious! You should make it for yourself!! You are most welcome! One of my favorites too!! Rice pudding is one of my favourite desserts and this looks absolutely delicious. Certainly need to give it a try. One of my favorites too! I just love it!! You are most welcome Erika! I love rice pudding. So rich, creamy and sweet. I wish I had some right now! I have an eggnog bread pudding but not a regular bread pudding. My daughter has a fabulous bread pudding recipe right here! Please let me know if you need this and rice pudding recipe emailed to you.